Boho style long white dresses such as the Esperance are part of the new Hello lovers collection. Featuring a covering of fine bridal lace long sleeves and a lace backs. Leah S Designs wedding dress styles everything from traditional to Relaxed casual. Also the only retail bridal shop that has the entire range of Hello Lovers Australia. The Hello Lovers range is perfect for a destination wedding or garden ceremony. Our just because you can. Never underestimate the weight of a fabric it has to be just right to as to drape over the body and obtain ultimate fit. 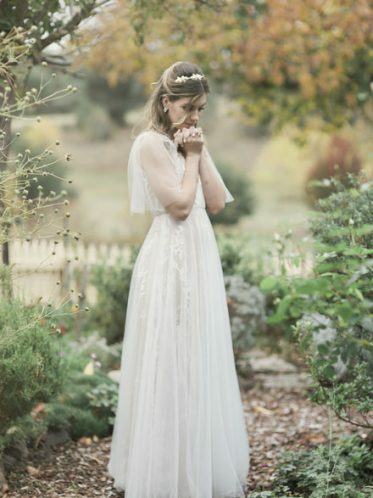 The Esperance gown has just that with a covering of fine bridal lace that sits just right. This gown features a knee length split. Just enough to be flirty. A beautifully shaped gown that will compliment all your curves. Leah S Designs also has an extensive range of bridal jewelry. Hair vines, bridal hair combs and tiaras. Hello Lovers is also renown for its stunning range of wedding jewellery truly unique pieces made in Melbourne. Some designs with a bohemian feel other styles with a more traditional edge. All with matching accessories such as earrings necklaces or bracelets. To complete your look you might like to wear a long cathedral wedding veil we have them too. Your wedding photographer will love the long veil and you will get some fabulous photos with it. 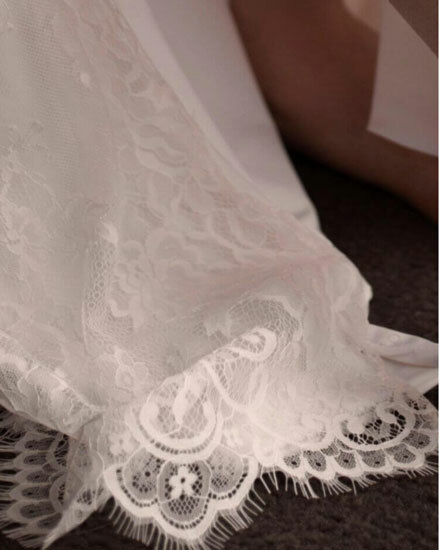 The vintage bridal lace in the Esperance long white wedding dresses has also been lovingly made into matching ring cushions. This will give you a level of detail nobody is expecting and also a wonderful keepsake. Not forgetting the opportunity to wear an amazing pair of shoes with this gown the split will show them off wonderfully. We would recommend the Doris wedding shoes. Boasting an extensive range of accessories something to suit all bridal styles. Also many off the rack wedding dresses. Also ready to wear deb dresses for sale, matching bags and wedding shoes Melbourne.